My costume is inspired by Harley Quinn. I made the hammer from some large round Christmas boxes I got on sale taped them together and raped the whole thing in foam and hollowed out the middle so I could put stuff in it. I added a little door and used for trick or treating as my cand bag. the dress I got from my cousin she had used it the year before and gave it to me. the hat was a black top hat I got a spirit and painted red stripes on. 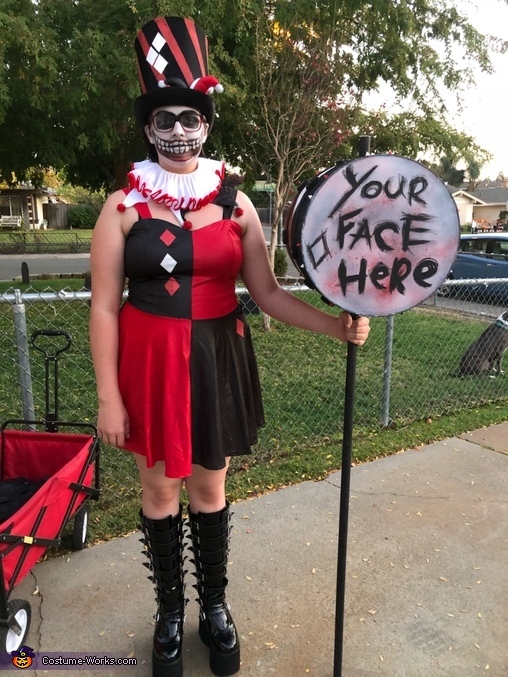 And my make up was inspired by a picture I saw on Instagram called crazy smile Harley it is supposed to me her with a over exaggerated smile.